InSight used its built-in thrusters for the final stretch of the Entry, Descent and Landing, and the thrusters seem to still be attached. Would it have been at all possible for InSight to lift off again, just a bit, and move over slightly if NASA found it's first landing spot a serious challenge to its scientific goals for some reason? Engines: reusable. InSight uses 20 thrusters of three different models, all built by Aerojet. They all use the same hydrazine monopropellant, and can be restarted. The engines vary from 1,500 to 275,000 duty cycles -- more than enough. Over the course of the mission, as propellant is expended, tank and feed pressures will decline and cause engine thrust and specific impulse to decrease – requiring detailed analysis of the thruster response to decreasing inlet pressure to ensure accurate maneuvering over the course of the mission. Landing legs: no. The shock absorbers on the legs are one-use only. Shock absorption is accomplished with an aluminum honeycomb crush core that functions in the form of a compressible cartridge between an inner and outer cylinder to serve as a one-use shock absorber. Batteries: sure, after they are given a full recharge. Solar panel: risky. The panels were folded in a circular-pleated pattern prior to launch. They are already extended, and not designed to be retracted and re-folded. Damage would be likely if the craft flew with them extended. IMU and landing radar: no problem. It uses accelerometers, ring-laser gyros, and a conventional radar to guide landing. All can be easily restarted. Robotic arm: probably okay. Even if it didn't return entirely to its stowed position, it should be fine. Cameras: risky. There are dust covers which must be removed to survey the site, before you'd make a decision to re-launch. You can't put those dust covers back on. The camera under the deck (ICC) particularly got a lot of dust during landing. This article provides a very detail overview to InSight spacecraft. It goes through variety of perspectives from Cruise Stage to Aeroshell & Parachute, Lander Structure, Electric Power System, Propulsion & Atttitude Actuation, Attitude Determination, Landing Radar and finally Data Handling & Telecommunications. First, you'd need to know why InSight lands on where it was landed. Why NASA chose Elysium Planitia as InSight's home on Mars? 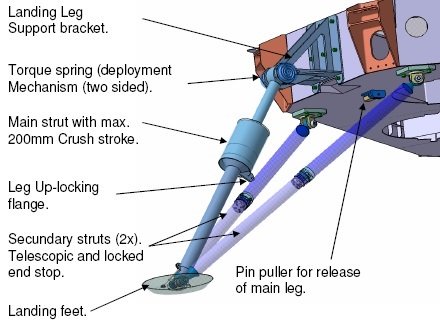 The team considered two key criteria as they decided where to place the lander. The first is safety. Landing on Mars is always a challenge because of the planet's thin atmosphere, so the InSight team wanted a patch of fairly flat land to reduce the risk of the three-legged robot toppling over at touchdown. The second factor, of course, is science. It's particularly important that the landing site meet the team's research needs since InSight is a lander and can't move itself around the Martian surface: Where it lands is where it will learn. That meant the location needed to be able to accommodate InSight's instruments, especially the probe that will hammer itself 16 feet (5 meters) below the surface in order to measure the planet's below-ground temperature. Other constraints included someplace warm and sunny enough to keep InSight's electronics happy, and to let its two large, circular solar power arrays create enough energy to keep the robot going. That said, Elysium Planitia practically is the flattest spot that NASA could found on Mars as the best landing site to fulfill InSight's scientific requirements in the meantime avoids any future concern as much as possible. How big and heavy is the InSight? The InSight Lander is 5 ft. 1 inch (1.56m) wide and 19 feet 8 inches (6m) long and weights 794 pounds (360 kg) which is roughly the weight of about 5 adult people. What instruments does the InSight Lander have? SEIS: A seismometer that can provide information on internal vibrations or Marsquakes occurring within the Red Planet. Depending on the material the vibrations propagate through will change the way the seismic waves travel which when detected can tell scientists what the materials are. HP3: A heat probe that will burrow almost 16 feet (5 m) into Mars’ surface – the deepest to date. The probe will help scientists measure Mars’ temperature and work out whether Mars was formed from the same materials as Earth or not. RISE: A radio wave instrument that can help scientists work out the size of Mars’ core as well as its composition by sending out a signal and seeing how it changes in frequency via the Doppler shift. Instrument Deployment and Instrument Context Camera: The former being a camera that offers a 360-degree panoramic view of the Martian land in color. The latter being a camera that will take ‘fisheye’ field of view of the Lander’s workspace. While SEIS & HP3 would have to deploy on the ground in the following weeks on Mars, that is why InSight was designed as a stationary machine and its main goal is to study Mars interior core. Now back to topic with the relevant article I have provided above. Would it have been at all possible for InSight to lift off again, just a bit, and move over slightly if NASA found it's first landing spot a serious challenge to its scientific goals for some reason? I'd say this is unlikely to happen as the landing site was carefully chosen with the reference above. It's relatively impossible that NASA would faces a 'serious challenge' on the spot. Because no active hazard-avoidance is used by InSight, the legs must be capable of supporting worst-case landing scenarios like 16° slope and up to 40cm rocks in combination. The biggest challenge for InSight to touchdown would be the potential risk of flip over; if its lander legs are so lucky to land on slope, rocks or in combination. Since InSight already successfully touchdown on Mars without issue, there is no point to lift off and move over a bit in general. The Propulsion Subsystem of the InSight Lander is identical to that flown on Phoenix – featuring a total of 20 thrusters broken down in three different groups: 1) Reaction Control System thrusters with a nominal thrust of 4.5 Newtons, 2) Trajectory Correction Thrusters operating at 22 Newtons and 3) Pulsed Landing Thrusters generating 293 Newtons of thrust for attitude control and velocity reduction during the Mars Landing Maneuver. All thrusters are fed from two central tanks containing ~65 Kilograms of usable propellant. In a nutshell, I think there was no thruster particularly designed for InSight to lift off. Even if it could, as most of the hardwares were 'exposed' after the first successful landing, a second landing (even just a small ones) would probably causes sabotage. If you're expecting a hypothetical answer, maybe someone else could answers you. It would be interesting, though. Not the answer you're looking for? Browse other questions tagged mars nasa lander insight or ask your own question. How do Mars spacecraft control attitude on final descent and landing? What is the meaning of this writing on the InSight lander, and why is some in Braille?